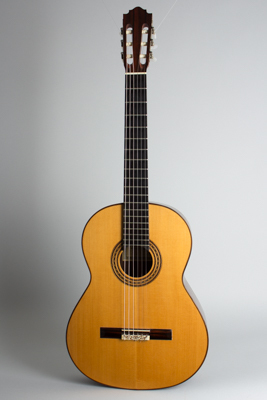 Nicholas P. Ioannou Classical Guitar (1992), made in New York, Natural french polish finish, Brazilian rosewood back and sides, alpine spruce top; laminated Spanish cedar neck with ebony fingerboard, black hard shell case. This instrument was built by Nicholas P. Ioannou, a Greek-American luthier who crafts lovely traditional concert guitars. The finish is a very thin French polish and all of the woods are top notch selections. There is a lovely carved decoration on the top of the bridge that is a distinctive touch. The builder is more interested in a traditional warm and balanced sound than pure volume, and speaks of being inspired by the traditional Spanish sound of Segovia, Bream, and their peers. The label is signed and dated by the builder "New York 1992" and the guitar appears to have been played but very well cared for since then. Overall length is 39 1/2 in. (100.3 cm. ), 14 5/8 in. (37.1 cm.) wide at lower bout, and 4 in. (10.2 cm.) in depth at side, taken at the end block. Scale length is 25 5/8 in. (651 mm.). Width of nut is 2 1/16 in. (52 mm.). This guitar is all original and shows no repairs or notable damage, just typical play wear to the very thin finish. The action is currently set at 5 mm bass and 4.5 mm treble, with just a bit of room on the saddle to lower it if desired. This is a lovely sounding guitar with a deep resonant tone, rather unlike many modern concert guitars that tend to favor volume and high-mid and treble tones in search of more projection. This guitar has plenty of volume, combined with a rich deep sound reminiscent of the guitars of 50+ years ago. Excellent - Condition.